The WildLife Trusts 30 Days Wild is running in June. The campaign encourages everyone to do something wild every day in June. Nick Baker’s My Living World Nature Study kits is a great way to investigate nature’s creatures up close. Nick Baker is the vice president for the Wildlife Trusts and he has worked closely with Interplay to create the My Living World sets. Today I am running a giveaway to win one of the amazing sets Bug Safari so the winner can get out and about with their child/grandchild etc to explore nature and have fun catching and identify many mini beats. All kids love bugs, and this kit provides them with easy to use, professional quality equipment to enable them to catch, study and identify common mini-beasts in their gardens, in parks or in the countryside. Includes a full colour 20-page booklet written by wildlife expert Nick Baker on how to use the equipment, and charts to help identify the creatures caught. 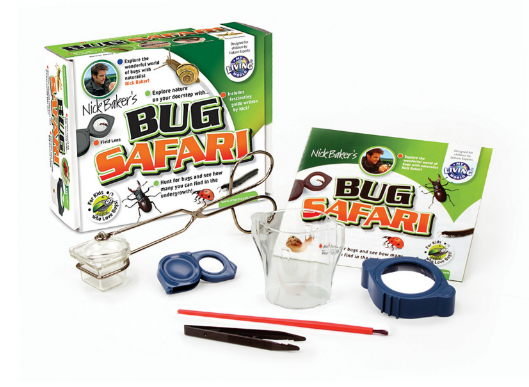 For a chance to win a bug safari set complete the rafflecopter below. Definitely butterflies! My little boy went to 'Bugtopia' for his school trip so he would love this! My son loves all bugs, well, all creatures really. He just recently lost his pet slug (yes really) and was absolutely devastated. He would really like this set, as as well as his love for everything living, he wants to be a scientist. Do bees count as bugs? Because they are her favourite. Ladybirds are the favourite- I think its the red colour ! Alexander loves slugs ans snails, typical little boy!! My niece Chloe loves ladybugs! My daughters favourite bug is a Butterfly! (I've just asked!) Although her nickname is Lilybug, so she's bound to love them all! Butterflies especially big colourful ones! Ladybird are a bit at ours! my daughter is currently into spiders! My son loves watching bees buzz from flower to flower.